Can Biophilic Design Really Benefit Your Workplace? The short answer? Yes. Here’s why. The gray, drab, cubicle-lined workplace is becoming a thing of the past. Many companies, especially those interested in competing for top talent, are aware that these offices just won’t cut it anymore. While some companies such as Google, Amazon, or Apple are on the cutting edge of modern work spaces and employee benefits, other businesses are slowly starting to catch up. Studies show that one of the most beneficial changes to an office space is the inclusion of nature elements such as plants, vines, or flowers. 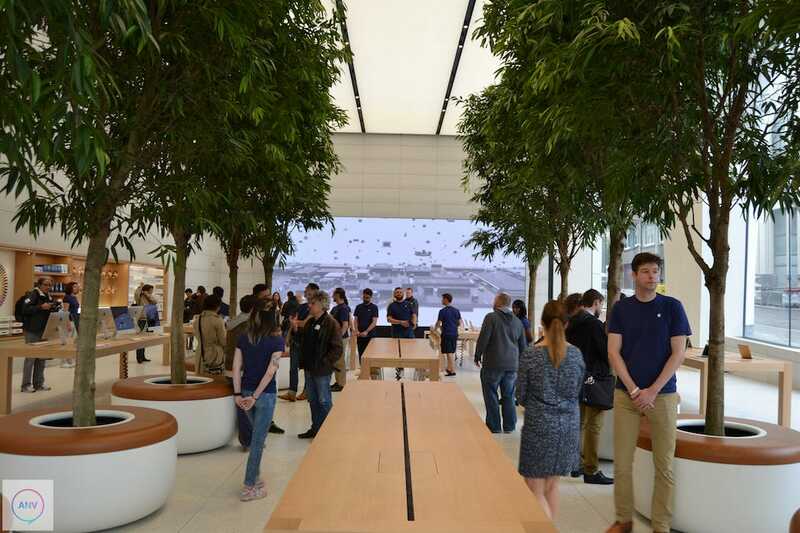 And we don’t mean just the odd cactus on your coworker’s desk, but entire swaths of greenery such as Etsy’s offices or this Apple store with trees inside. Coined by psychologist Edward O. Wilson in the 80s, Biophilia is a drive to reconnect with nature; especially in the dense urban environments of our world. Using that idea, biophilic design aims to include greenery and nature in the workplace or a business. Studies show that offices using biophilic design ideas have employees that are 10% happier, healthier, and more productive. Cleaner Air: Plants are extremely effective at taking toxins from the air and cleaning them, producing clean oxygen as a byproduct. While many offices are equipped with state of the art air conditioners and air filters, there is sometimes no substitute for nature. Certain studies show that interior landscaping plants can capture and remove toxins such as formaldehyde, benzene, and hexane from the air. Improved Health: Through a combination of objective measures such as breathing cleaner air, and subjective factors like mood and stress, greenery in the office improves health. Dr. Wilson’s research suggested that the move to the cities for families came at a cost. The inability to connect to nature, see outside, or avoid the sterile environments of traditional workplaces created a lot of stress for people, on top of whatever their job may add. Biophilic design aims to help remove that stress by reintroducing that natural element back to your day. Improved Productivity: In keeping with the theme, people who are less stressed are more productive. However, there is the additional benefit of increased creativity and ideation in offices that have green elements. A study from Texas A&M University showed that people who were surrounded by nature and natural elements were better able to problem solve creatively. At King Business Interiors, we believe in the future work space and the benefits it provides. While it may sound far fetched or expensive to some, the benefits and correlation is clear and supported by evidence. In addition, if you haven’t seen our new space, it’s a great opportunity to do so! We have a live plant wall in our kitchen so you can check out some biophilic design in action. If you’d like to know more or are interested in exploring designs for a new or renovated space, contact us today. Prev PostHow WELL Standard Certification Can Improve Your BusinessNext PostDo You Know the Best Solution for Cabling in Your Office?